There aren’t a lot of things that can rival a trip to the nail salon-who doesn’t like crisp, painted nails? Unfortunately, nail polish is yet another substance with toxic components. Most of the time all ingredients are not listed, or we don’t bother to read them. This unawareness makes nail polishes all the more dangerous, not to mention the fact that simply because it is applied to nails doesn’t mean that health issues are not a concern while using it. What makes nail polish have that smooth sheen and sleek finish? 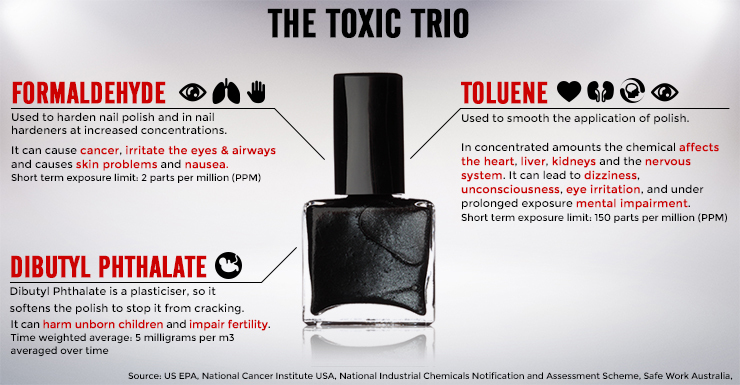 Found in the majority of nail polishes, toluene is responsible for just that. It isn’t just found in nail polish, either-it’s found in nail polish remover, one of the causes of that sweet smell. The vapors it produces are highly toxic, as prolonged exposure has been proven to cause brain damage, hearing loss, nausea, and abnormal fetal development. Not only that, it has been linked to several types of blood cancer. It possesses a rap sheet far too long for one ingredient. Have you found a great type of nail polish that just doesn’t chip? Well, dibutyl phthalate, or DBP is probably the culprit. Being a phthalate, it is found in vinyl flooring, building materials, nail polish, and dozens of other products. It is used for its durable properties, hence the anti-chip aspect in nail polish. Since phthalates are seen as estrogen by the body, it can cause hormonal issues, including decreased fertility, organ damage, and hindered fetal development. The longevity of your nail polish simply isn’t worth the health risks, it’s actually been banned in the European Union. Used in embalming dead people and animals, formaldehyde has long been labeled as a known carcinogen. It is an important ingredient in nail polish as it strengthens, hardens, and is a preservative. The versatility of it makes it too common in nail polishes, especially considering how dangerous it is. Repeated exposure can cause cancer, nausea, lung fluid buildup, and asthma, not to mention more minor side effects. It is banned or limited from use in the European Union, Japan, and Sweden. If a cosmetic product seems to have an abnormally long shelf life, it is most likely parabens. Found in nail polish as well, parabens are commonly added to prevent mold and bacterial growth. It does its job, but it blocks sunlight and air from reaching the nail, which is necessary for strong and healthy nail growth. It also has been linked with breast cancer in women. I don’t know about you, but I’d rather a shorter shelf life than have weaker nails. Considering nearly every nail polish that you may buy contains at least one of these ingredients, it may make you want to give up chic nails entirely! However, Piggy Paint is a great solution. Its an odorless, hypoallergenic, and water-based nail polish company that is made in the US-they offer dozens of cute colors for kids, entirely toxin free! 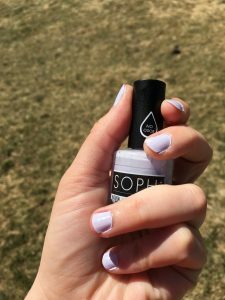 More recently they have come out with an adult line of polishes called SOPHi, so natural nails can be available for everyone! This entry was posted in Blog and tagged Formaldehyde, green team reviews, parabens, piggy paint, sophi, Toluene, toxic ingredients in nail polish. Bookmark the permalink.